Paperback / 5.25″ x 7.5″ / 144 pp. On a small ranch that sits between the empty prairie and the Rocky Mountains, Charlie is trying to keep his dying grandpa alive while carrying the responsibility of their winter survival. As the first storm of the season hits, a mysterious mountain man shows up at the isolated ranch; and good things start to happen. But can Charlie trust the giant stranger with his one haunting secret? 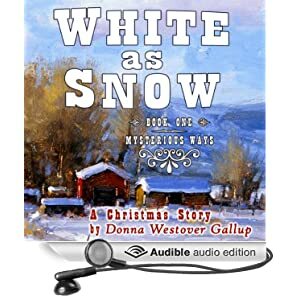 Listen to White As Snow on audio/audible. Audiobook Length: 3hrs. 47 min. Read by voice actor, Graydon Schlichter.